You’ll be shown all the equipment, the fermentation room, taste the different wheats and smell the malts that are used to flavour and colour the beer. They explain thoroughly the entire process, even down to the spent grains being given to the local farmer to feed his cattle, so there’s little to no wastage. The brewery tour was arranged by the local Wetherspoons, Talk of The Town to support Clic Sargent. An amazing charity that supports young cancer patients. We all met in Talk of the town and they had arranged taxis to pick us all up at 5:30PM and would then drop us back later. Upon arrival you’ll be greeted by a friendly and knowledgeable member of staff. Who will take you into the into the main storage room where you’ll be given an empty pint glass. Firstly this needs to be filled, so straight away your taken through into another smaller storage room full of kegs. In here is a rack with all the current ales to choose from, tapped and ready to pour. The number one rule of tour is, no empty glasses! Drink as much as you like, you’re free at any point of the tour to wander back to the rack and fill up. Cider lovers don’t worry, they have ciders to. You’ll just have to pour it from the bottle into your glass. 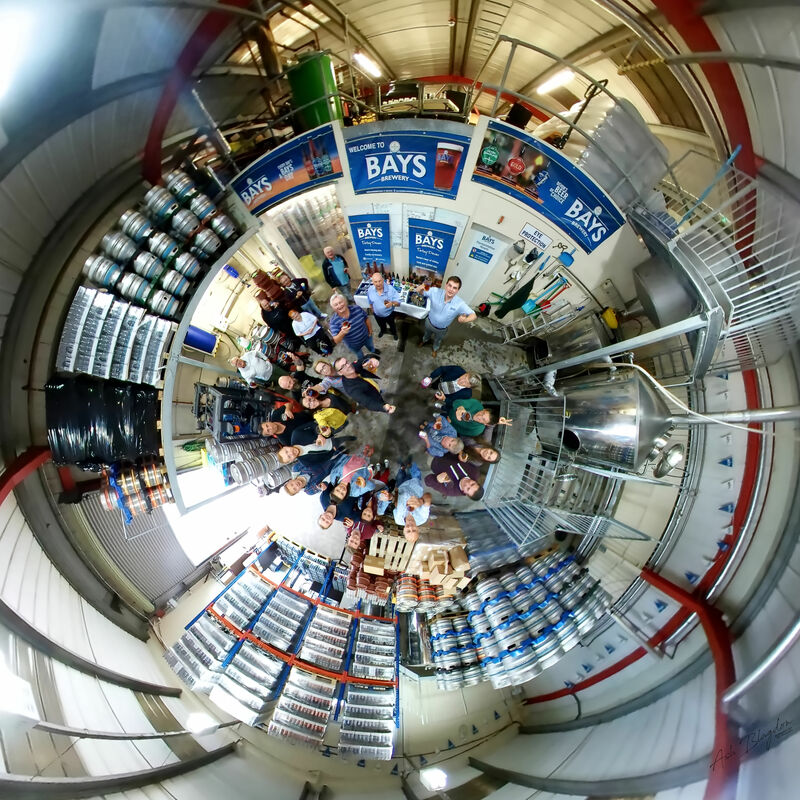 We were walked through the entire process showing all the equipment needed to make Bays beer. The giant fermentation tanks frothing at the rim, sticking our heads inside the giant kettle and they had a table laid out so we could taste all the different wheats and smell the malts they use to flavour the beer. One tasted like burnt toast, I certainly wasn’t keen on that one. It was interesting to learn that even the spent grains don’t go to waste and once a month the local farmer comes along to take it all as feed for his cattle. With the solar panels on the roof as well, the place runs very efficiently. I have to admit come the end most of us were starting to feel quite jolly, myself included, but the atmosphere was always one of enjoyment and having a great laugh. I suppose it would depend on the group your with, I was lucky to be with a great group of people. When we were done, I think it was around 9PM, by this point i was very jolly, so the time was a wee bit vague. The taxi had arrived to pick us up and take us back into town. You can probably tell from my lack of patience while I took the photos we all enjoyed ourselves immensely. Doing it through spoons was well worth it though. For just £15, transport was provided and once there you can drink as much as you like and learn about the journey process from the ground to your lips. Our group raised an amazing £449.21 for Clic, so next time your in Talk of the Town look out for a Brewery Tour leaflet. Bays Brewery brew premium ales using the finest local ingredients whilst also supporting the local community and protecting the environment. There products are delivered to hundreds of pubs, restaurants and shops all over the South West and further afield which has firmly established them as one of the region’s top breweries. Of course you can arrange your own tour with your friends, just contact the brewery and ask. Depending on the size of group the tour will take 1½ hours, maybe more for larger groups. As you’ll be drinking you’ll want to arrange a taxi or a friend to take you to and from the brewery. Torbay Taxi 01803 211611 or Price First Taxi 01803 322322. Tour will take 1½ hours, maybe more for larger groups. 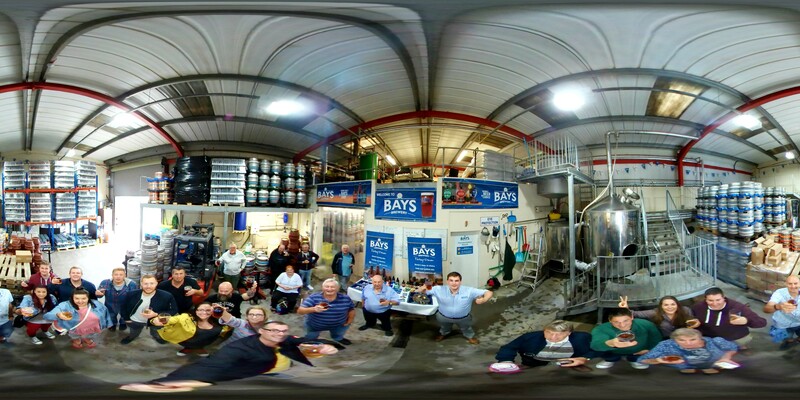 Have you done the Bays Brewery Tour? What did you think?